Sringeri is a hill town which is located in the Chikkamagaluru district of Karnataka. The place is the site where Adi Shankara established his first Matha in the 8th century. The Matha is known as Sringeri Sharada Peetha and is located on the banks of the river Tunga. The name Sringeri is taken from Rishyashringa giri, which is a hillock believed to be the home of the sage Vibandaka and his son Rishyashringa. Rishyashringa comes in a story in the Bala Kanda of the Ramayana where the sage is believed to have brought rain to the drought-stricken kingdom of Romapada. By Air: Mangalore international airport is the nearest airport which is about 66 km away from here. It is connected to all the major cities in the country and to a few abroad. By Train: Mangalore Junction is the nearest major railhead. The station is well connected to all major towns and cities around the state and to various places around the country. By Road: One of the best ways to reach Sringeri is by road. The town is well connected by roads and there are regular buses which operate from major cities to Sringeri. For those who want to travel by Route 1, it would take you approximately around 6 h to reach Sringeri, via NH 75. The route takes you through the well-known towns of Hassan, Belur and Chikkamagaluru, etc. The roads are well maintained, which helps one to cover the distance at a good pace and the destination is about 327 km via this route. If you opt for Route 2, it would take you approximately 7.5 h to cover a total distance of 378 km from Bengaluru to Sringeri, via NH 48 and SH 24, to reach Sringeri. The journey can be planned as a weekend drive. So, one can opt to leave on a Saturday morning and after spending about a day and half, one can start travelling to Bengaluru either on a Sunday morning and reach the city by evening or night. To beat the traffic in Bengaluru, it is best to start off early, which helps you drive past the expressway in no time and cross over the border without getting stuck in the traffic snarls. Once on the highway, there are plenty of options for one to have breakfast. Making a stopover at Nelamangala for a quick and yet filling breakfast of hot dosa, would give you all the energy you need until you decide to make the next stop at Belur for lunch. The roads from Nelamangala take you through the rural and semi urban side of Karnataka, which is something very different and yet refreshing for those coming from a metropolitan city like Bengaluru. Belur is a historically important town, which is home to the renowned ancient temple of Chennakesava. The temple is a fine example which showcases the expertise of the Hoysala artisans. As per legends the temple took 103 years to be fully completed. The temple was built by King Vishnuvaradhana to mark his victory over the Cholas at Talakadu. Sringeri is a temple town and is home to the famed temple dedicated to Goddess Saraswathi, who is known as Sharadamba here. Apart from the Sharadamba shrine, the town is also home to another well known temple of Lord Shiva who is known as Vidya Shankara. The Sharadamba temple was built in the 8th century by Adi Shankaracharya. The temple housed a sandalwood idol of the goddess in standing posture which was installed by Adi Shankara, but was replaced with a gold idol of the goddess in seated posture in the 14th century which is worshipped till date. The shrine also has a crystal lingam which is believed to have been gifted to Adi Shankara by Lord Shiva himself. The lingam can be seen when the Chandramouleeshwara pooja is perfomed every day in the temple at 8:30 pm. The Vidyashankara temple was built by Vidyaranya, who was the patron saint of Harihara and Bukka, the brothers who founded the glorious Vijayanagara Empire. The temple was built in honour of the pontiff Vidyashankara and is dedicated to Lord Shiva. The temple is an architectural marvel to be seen, and it also displays a very unique pattern which shows the astronomical expertise of the builders. 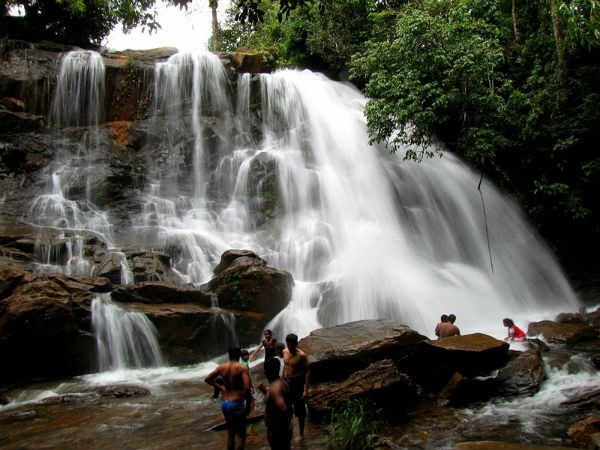 At a distance of 12 km from here, Sirimane Falls is a major attraction. It is one amongst the numerous falls which is born in the Western Ghats. The falls are found in a small village called Kigga which is accessible only by private transport. Sringeri Sharada Peetham is one of the four mathas established by Adi Shankara. The other mathas established by Shankara are found in Puri, Dwaraka and Badrinath. Sharada Peetha remains the centre of Smartha Tradition. The head of this math is called Jagadguru and also carries the title of Shankaracharya; the present pontiff is Shankaracharya Sri Bharati Tirtha.